We have received all 5 star reviews, 100% of guests would stay again. Fantastic Luxury Apartment located right beside the river at the Ha'Penny Bridge, Serenity in the City, Close to everything, yet so peaceful, have a great nights sleep and still be 5 minutes from Temple Bar. Top spec apartment recently remodeled, new kitchen, bathroom and all new furniture and appliances. Flexible check in times for early flight arrivals. 5 minutes from Airport bus stop. We have received 5 star reviews, 100% of guests would stay again. Apartment has recently been totally remodeled, with new kitchen, bathroom, all new furniture and appliances. Fantastic ground floor, Two bedroom, One bathroom apartment. Direct access to the fabulous interior gardens. The apartment is right in the center of the city, yet you will be amazed at how peaceful and tranquil the apartment and the interior gardens are. Enjoy your morning coffee in the garden. The apartment complex was built in 1995, they saved the Victorian facades of all the old buildings on the river quays and built modern apartments behind the old building facades. 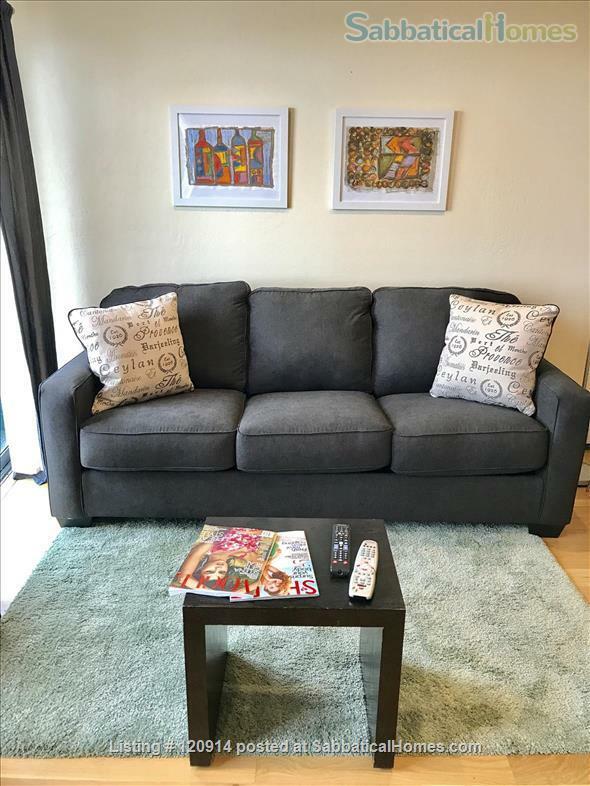 This apartment is also our home when we are in Dublin, it is decorated and furnished to a five star standard, and you will love staying here as much as we do. I am originally from Dublin and currently live in San Francisco and am available everyday by email or phone. My daughter lives in Dublin and manages the apartment; she will meet you and check you in when you arrive. She lives close by and is available for any questions you may have.And she is available to Babysit, advance notice required. Bus stops and the Luas (Trams) are all right outside the apartment. The airport bus stops a few meters away. A great way to see Dublin is on a Bike!! Dublin Bikes station 5 minutes away on Strand Street, Bikes are really cheap and you can drop them off at any Dublin Bikes location in the city, only 50 cents for 30 mins. You can also rent a car by the hour or by the day with GO CAR, there is GO CAR location close by. Two bedrooms: King bed in master bedroom and two Bunk beds in the second bedroom. PLEASE MAKE SURE THAT YOU ARE ALL OKAY WITH THE SLEEPING ARRANGEMENTS, ONE KING SIZE BED AND TWO BUNK BEDS, I AM 6.1 ft (185m) TALL AND I HAVE SLEPT IN THE BUNK BEDS AND THEY ARE COMFORTABLE. Bathroom has power shower over bathtub. Super fast internet and WiFi. Smart TV with Netflix and lots of channels. Fully Equipped kitchen, with Stove/Cooker/Oven, Microwave, Kettle, Coffee maker, Pots & Pans, Full size Fridge/Freezer. YES linens and towels are provided. This is a residential apartment complex and neighbors have to get up early for work. No late night parties, No loud music. Please be respectful of the neighbors and please treat the apartment as how you would expect guests to treat your own home.